"Recalling that a final vote will take place at the General Assembly on whether or not the quartet of former ministers should be tried or not, Kılıçdaroğlu called on all AKP lawmakers to "listen to their conscience and vote accordingly." 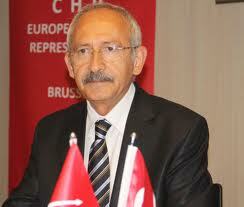 "Kılıçdaroğlu also criticized the verdict of the parliamentary commission over his Twitter account, saying that innocent and honorable men do not fear being held accountable for their actions, underlining that a fear of facing the Supreme State Council indicates an acceptance of the alleged crimes. Speaking directly to the four ex-ministers charged with corruption and bribery, Bahçeli said the ministers who were saved from being sent to the Supreme State Council will eventually be forced to face the consequences. “Turkey will no longer carry the weight of AK Party’s systematic blows to justice and morality,” he said. “No one can wave their finger at Parliament, which is the reflection of the national will,” he added. “It wasn’t a surprise verdict, it was a ruling that was expected. It is really very hard to say that the members of the commission from the government cast their votes without any pressure,” Destici added. “The result shows us perfectly clearly just how political [politically motivated] the given verdict is. They didn’t do the [ex-] ministers any favors. If anything, they caused hurt by taking away the chance for the [ex-] ministers to absolve themselves,” the BBP leader concluded. CHP İzmir deputy Aytun Çıray also had a few words to say about the commission and the verdict. “The members of the commission who are from the AK Party will not be able to face future generations out of shame — because politics is not a one-day event,” Çıray said. Çıray, who is also on the CHP Party Council, stated that no one can cover up the truth. “Everyone is aware of the situation. Future generations will not look at these commission members in a good way. We are now waiting for the vote in Parliament,” he said.